Indonesia has transformed from one of South East Asia's most repressive and centralised political systems to its most decentralised and democratic. Despite this, obstacles still remain that hinder Indonesia achieving the `rule of law', and in particular, the country is consistently ranked as having one of the highest levels of corruption in the world. 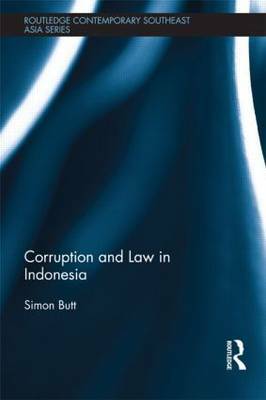 This book assesses Indonesia's anti-corruption reforms over the past decade, focusing on the Anti-corruption Commission (KPK) and the Anti-corruption Court (ACC). The book discusses how both institutions have been largely successful since they began operating on 2004. Before 2008, the KPK and ACC largely focused on mid-senior level targets and faced resistance primarily in the form of constitutional challenges to their jurisdictions and powers. From 2008, however, the KPK began targeting politically-powerful figures, drawing resistance that now threatens the future efficacy of both institutions. It is largely in Indonesia's courtrooms and lawmaking institutions that key battles between reformists and those preferring the status quo have played out. This book describes and analyses these judicial processes and legal changes. It shows that despite persistent claims that Indonesia's legal system is dysfunctional, law is far from irrelevant in modern day Indonesia. The book is a useful contribution to South East Asian politics and Asian law.